It’s a typical farmer’s market scene: freshly harvested honey from local hives, locally rendered goat cheese, carved wood ornaments. Perhaps even more so than food, you’ll find plenty of crafts and artisans selling their wares. 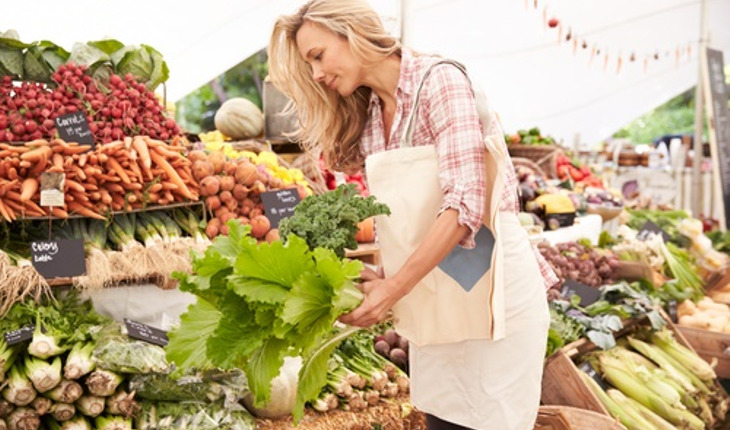 Are you more likely to find crafts and handmade items now instead of food at your local farmer’s market? Don’t be surprised if that’s the case. One reason is because consumers have become more wary of the very foods that drew them away from grocery stores and into to farmer’s markets in the first place. A devastating expose series that ran recently in the Tampa Bay Times revealed how some farmer’s markets are fakes, its vendors selling produce already rejected by the supermarket. How do you guarantee the food at your farmer’s market is truly farm fresh? Experts say the best way is to talk to the farmer or their designated sales person at the market. The United States Department of Agriculture or the USDA maintains a directory of markets they oversee. It is each market manager’s job to make sure what is sold meets government regulations. The market manager is also the point person who ensures that if food being sold is marked organic, that the grower provides documentation to prove that. The document emphasizes good practices for decreasing the risk of produce contamination from land and water used in growing; how to properly wash produce; hygiene practices for workers handling the food, not just in the field or in the packing area, but even at the market. Unfortunately even with these guidelines, a recent survey given to market managers by the USDA concluded that over 40% of managers responding indicated they have no food safety standards in place at their market, including but not limited to the use of raw manure as fertilizer, keeping animals away from growing areas, and availability of sanitizers and hand washing facilities in packing sheds. So, to some degree, it truly is a case of buyer beware. She advises chicken should be “flesh colored. If it’s got a yellow tint that means the chicken was given some kind of drug or supplement. With pork, you want to buy something with a lot of fat on it and there should be a fleshy, pink color.” And pay attention to your nose, she said, because smell is key. “Consumers should grill the seller about what he feeds his animals,” Giordano-Lena said. Once you buy the food, www.FoodSafety.gov advises consumers to always wash hands for 20 seconds with soap and warm water before and after preparing fresh produce. The produce should be washed itself thoroughly before eating, cooking, or cutting. Washing with dish detergent isn’t advisable, they say. Food that has to be peeled before eating should still be washed first. Cut and peeled fruit should be refrigerated within 2 hours after preparation. Be wary of unpasteurized juice or cider, which can be dangerous to pregnant women, older adults, and young children, or anyone with a compromised immune system, the USDA says. It’s not recommended to buy milk at a farmer’s market unless you can confirm it’s been pasteurized. Raw milk can harbor dangerous organisms including Listeria and Salmonella and E. Coli. This warning also goes for soft cheeses like Brie and Camembert and blue-veined cheeses like queso fresco and panela. Always check the label to see the cheese has been made from treated or pasteurized milk. At the Cannon Beach, Oregon, Farmer’s Market, near my new home, expect to find only food items that are fresh. The market, which takes place on Tuesdays June through September, is a small but eclectic outdoor event where you’re just as likely to find local wines as well as edibles ranging from fresh tomatoes and snap peas to peanut brittle from producers creating their product from less than 25 miles away. At the goat’s milk hand cream stand, you can even pet one of the milk-producing goats. That’s a good farmer’s market.